Portes Du Soleil, the vast Alps ski region that spans Switzerland and France, 14 villages and 12 ski resorts, is beautiful – with spectacular views, a mix of modern lifts, t-bars and pomas, and tons of ski terrain. 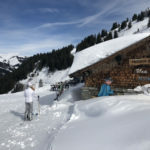 A highlight of this high alpine, highly scenic ski touring is on mountain lunch! 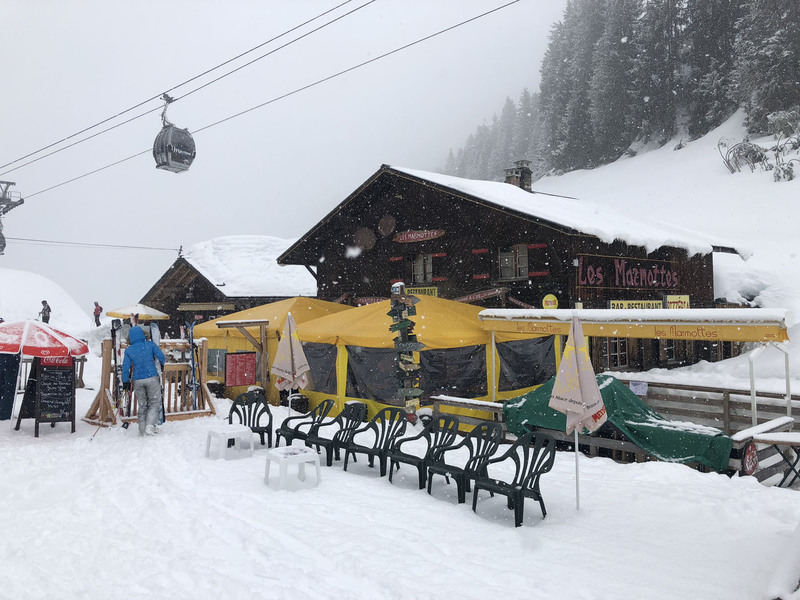 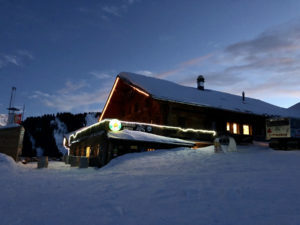 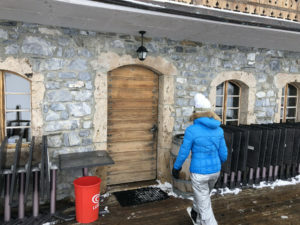 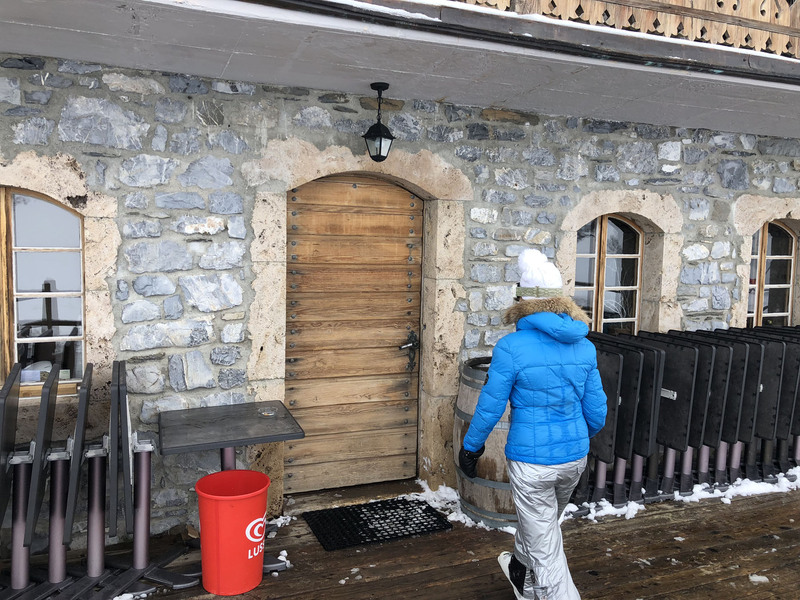 A chalet for a French Cappuccino, an aperitif, cold drink on the sun terrace, or vin chaud (hot mulled wine) and Swiss Fondue inside by the fire on a cold snowy day. 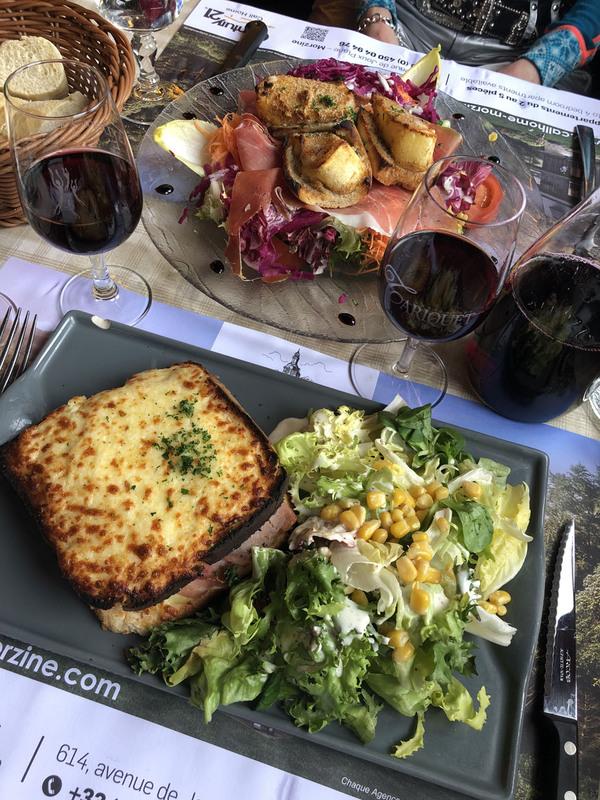 Tip: Always make reserve for lunch. 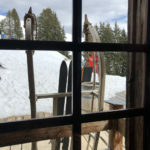 Even if you call at 10am that same day, call ahead and make a reservation. 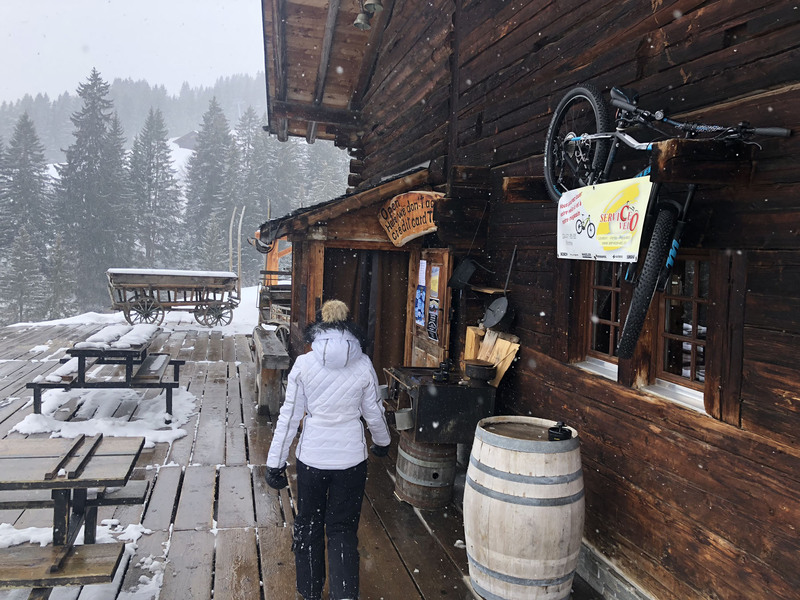 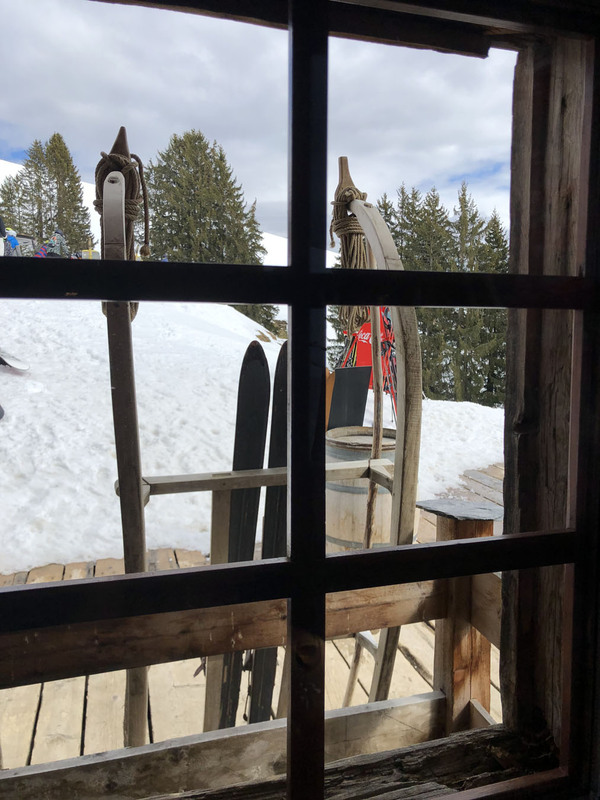 Mountain Huts save the best tables for reservations not walk ins. 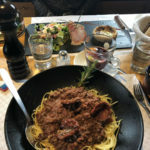 In fact, if you walk in and ask for a table they will often look at you like you have two heads. 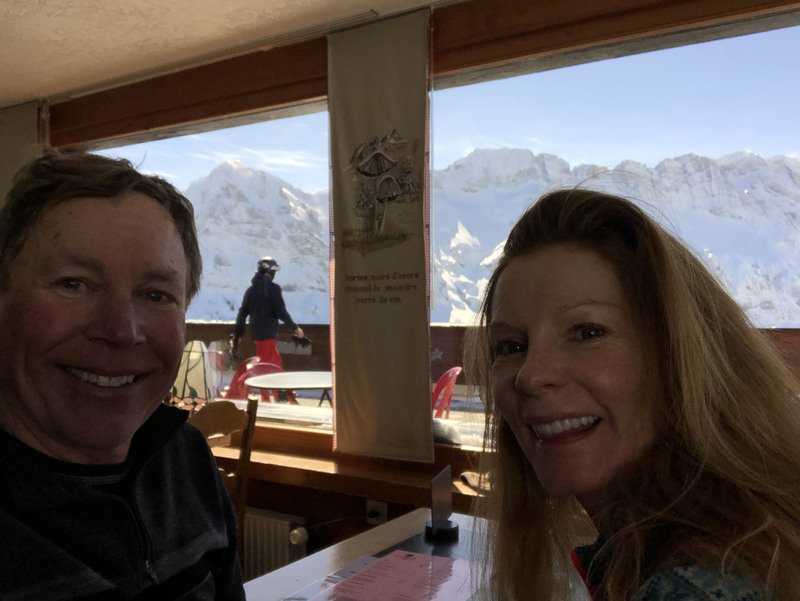 We enjoyed dining noon, as most Europeans break for a 2 hour lunch between 1- 2, making that a great time to get back out and enjoy the less-crowded slopes. 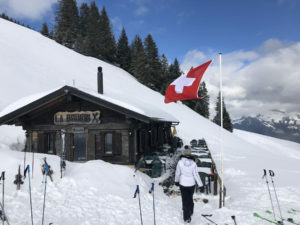 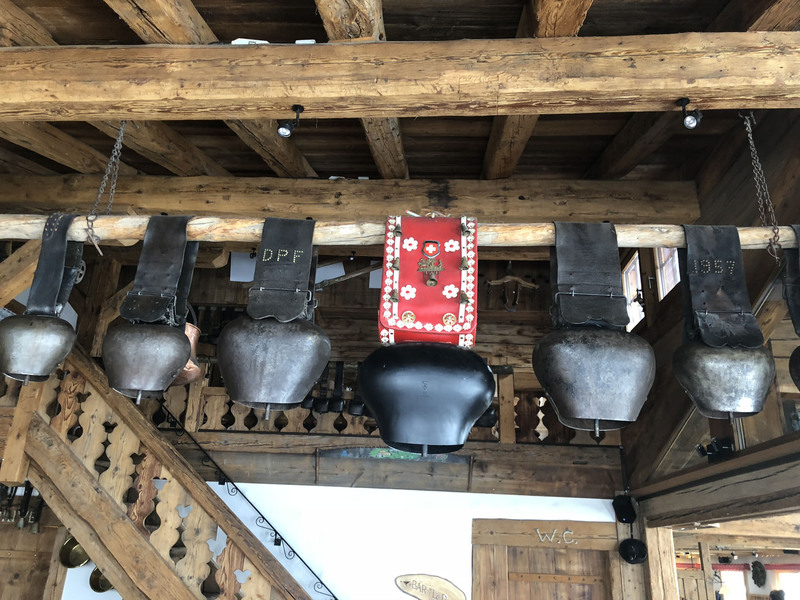 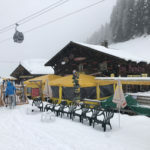 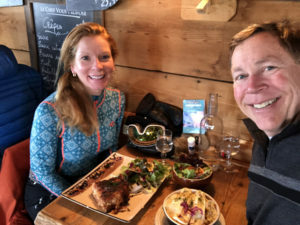 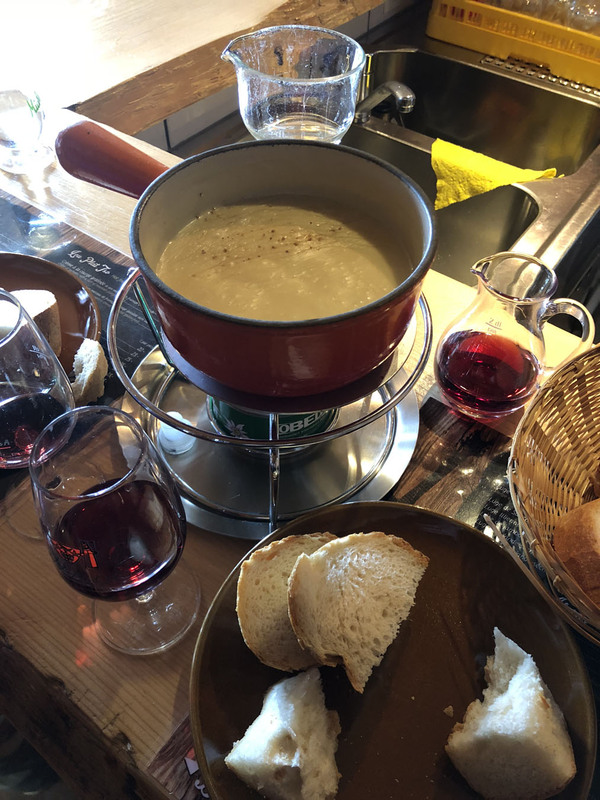 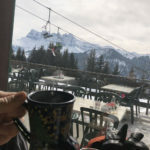 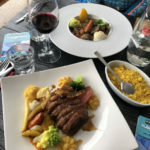 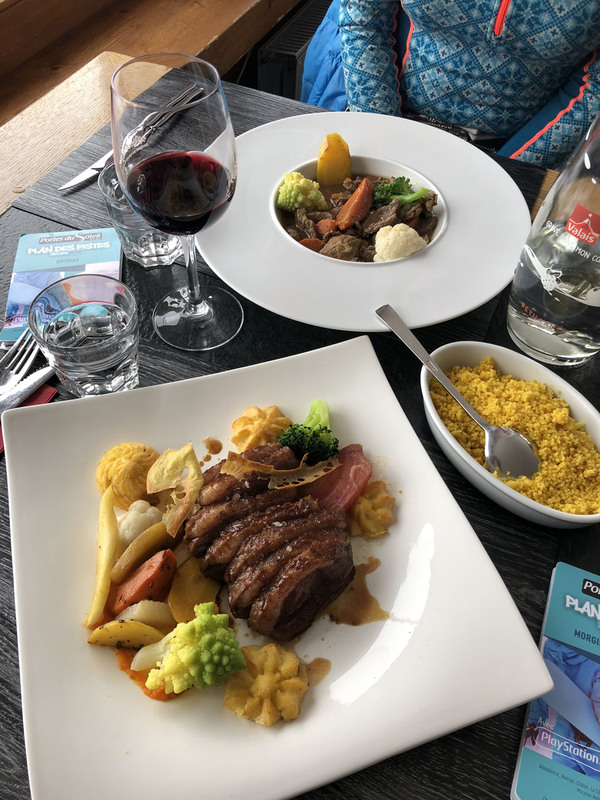 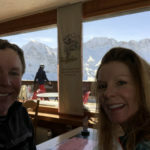 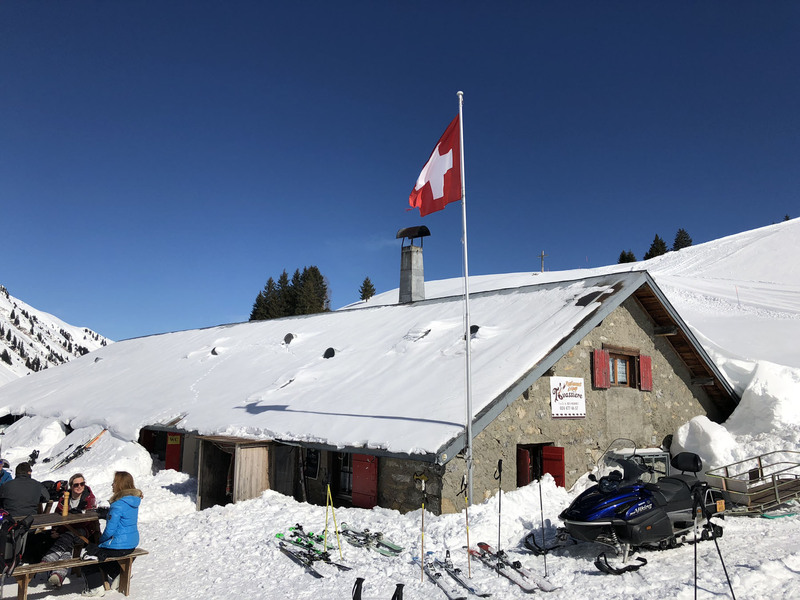 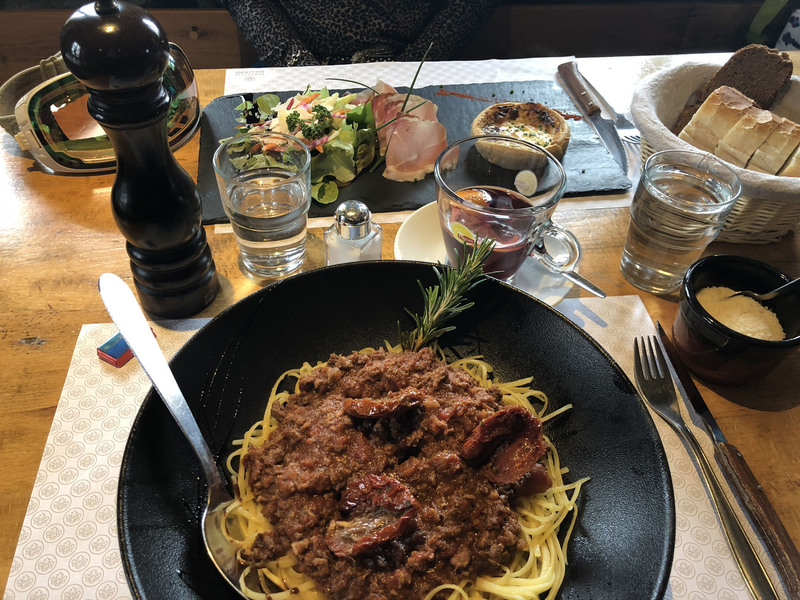 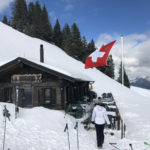 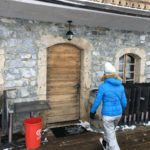 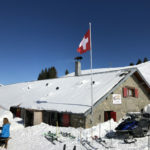 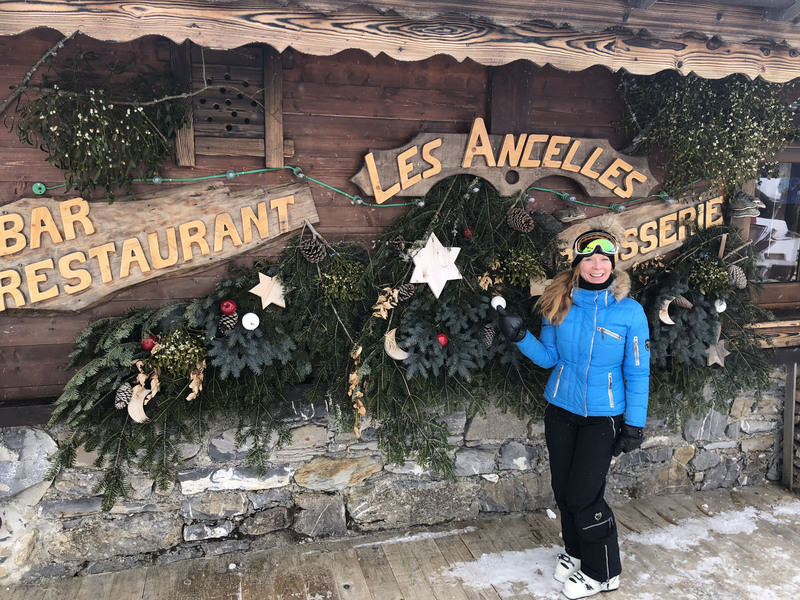 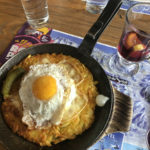 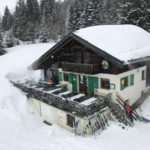 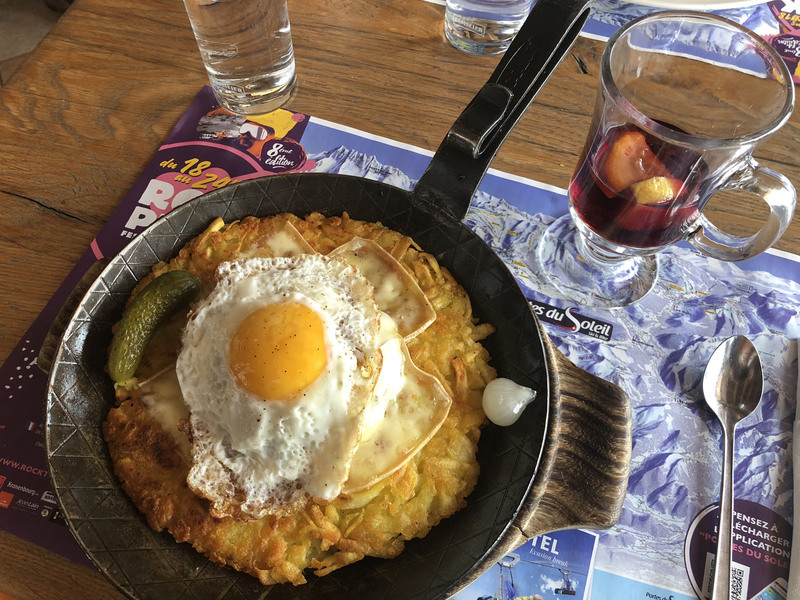 Dine at these top 7 Mountain Huts on the Swiss side and/or first four restaurants listed on the French side in the Portes Du Soleil and your are sure to have amazing lunches. 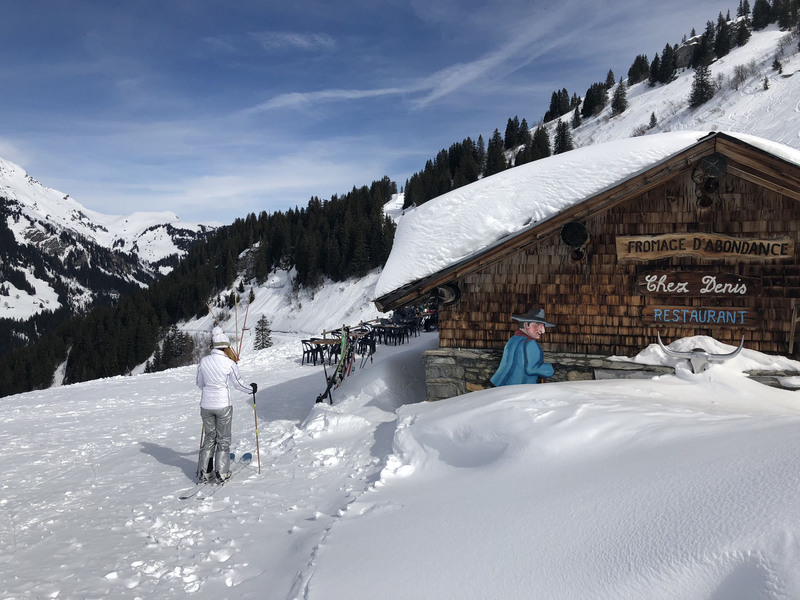 From the Swiss sides – Region Dents Du Mid, to the French slopes of Avoriaz, Châtel, Morzine and LesGets. 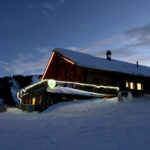 O’Padcha is the highest mountain lodge on the French side, Avoriaz, above the Swiss Wall. 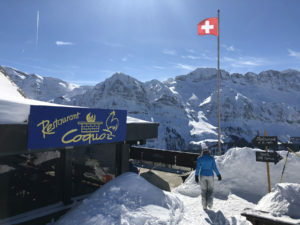 This is a great stop for mid-morning cappuccino! Furry pillows and blanched alpine wood provide a chic environment inside, and a bumping DJ plays outside on the sun deck. 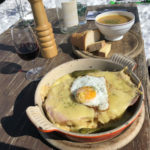 O’Padcha is self-service food. 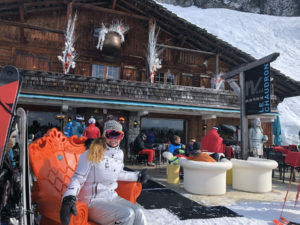 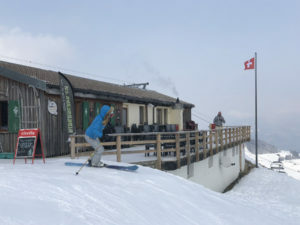 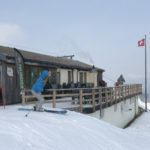 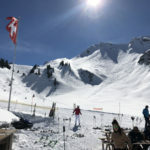 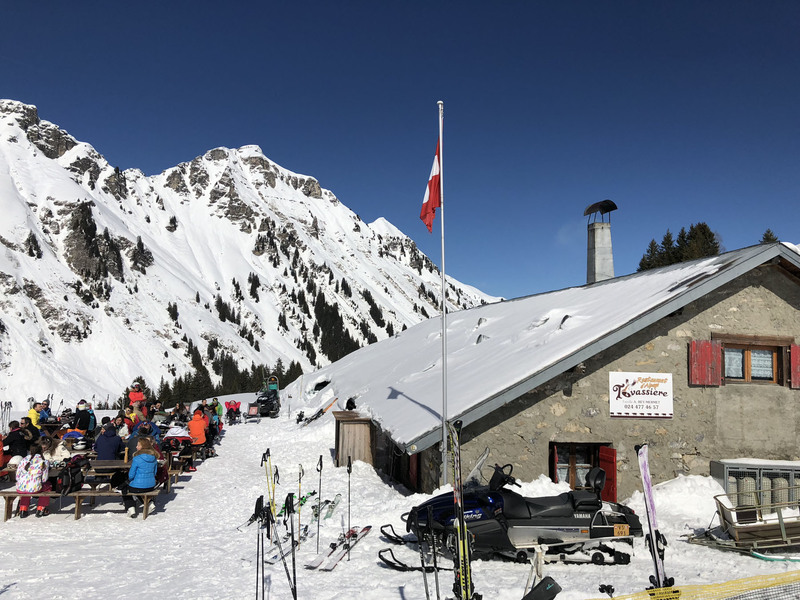 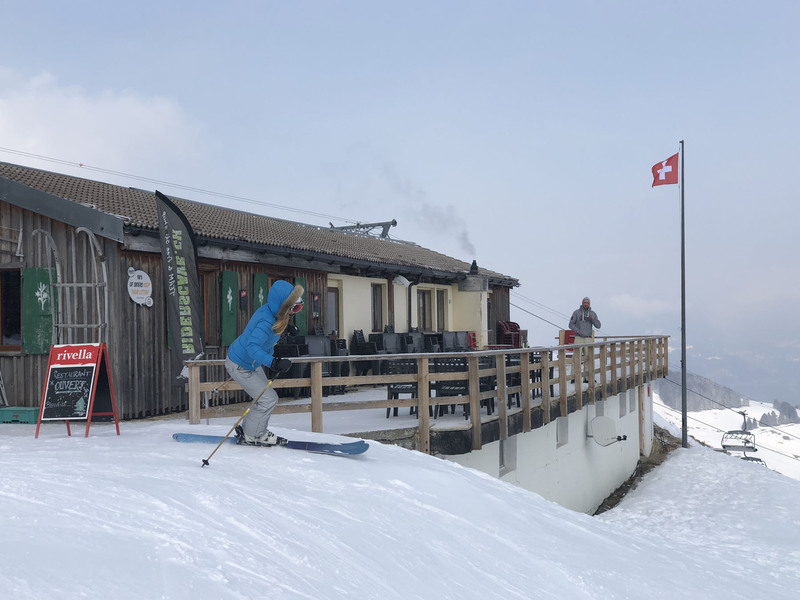 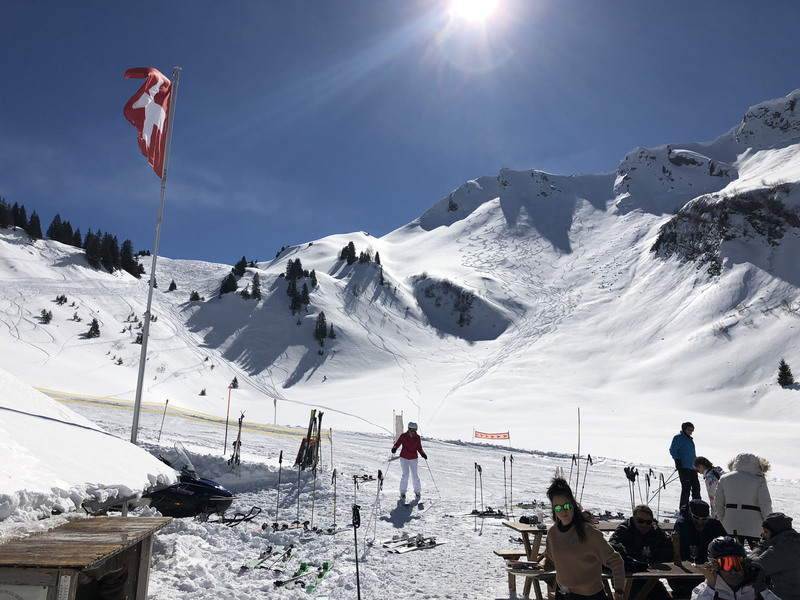 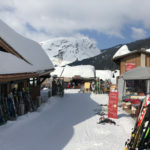 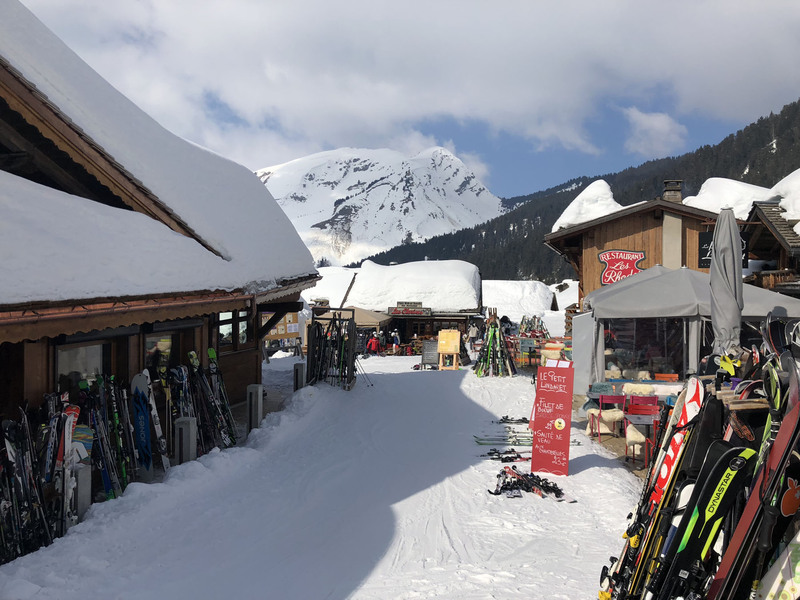 Go here for drinks and music on a sunny ski day, or for sustenance before dropping down the 90% Swiss Wall, or a vin chaud if you plan to download to Champèry watching others flail on the steep moguled Swiss Wall ski trail. 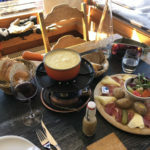 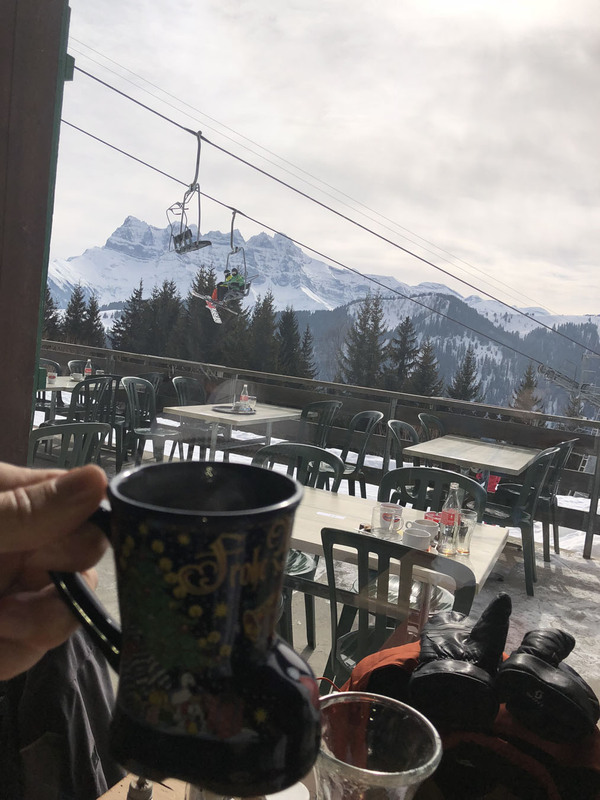 Chalet Bochasses is a self service restaurant with a spectacular location, staring out at the Dents Du Mid, in Morgin, overlooking Champoussin, stop for a vin-chaud and revel in the view from Les Bochasses. 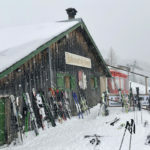 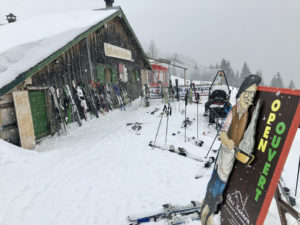 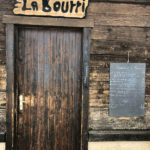 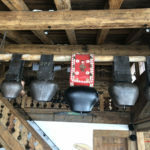 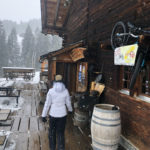 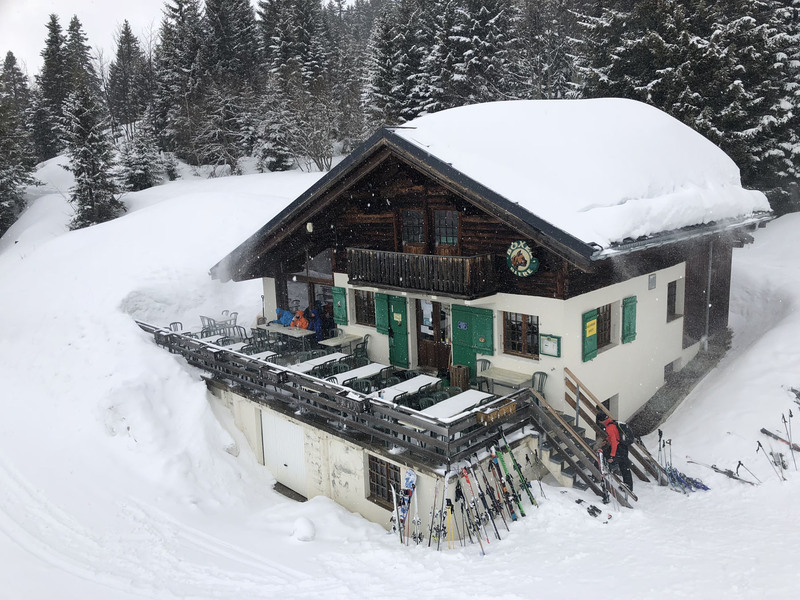 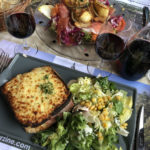 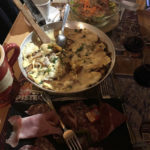 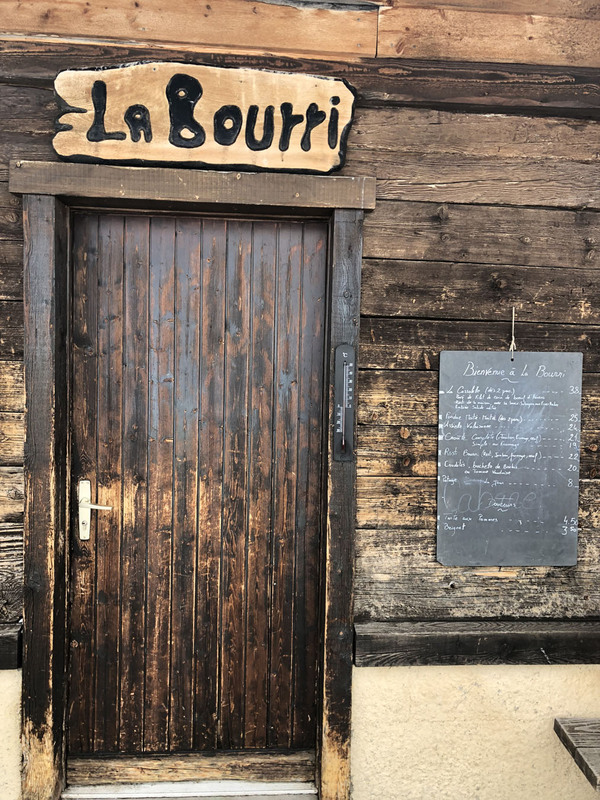 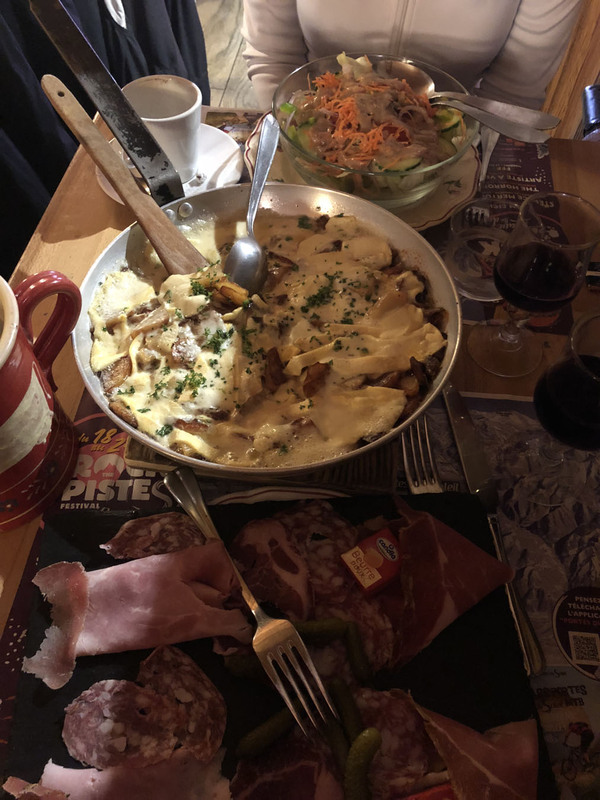 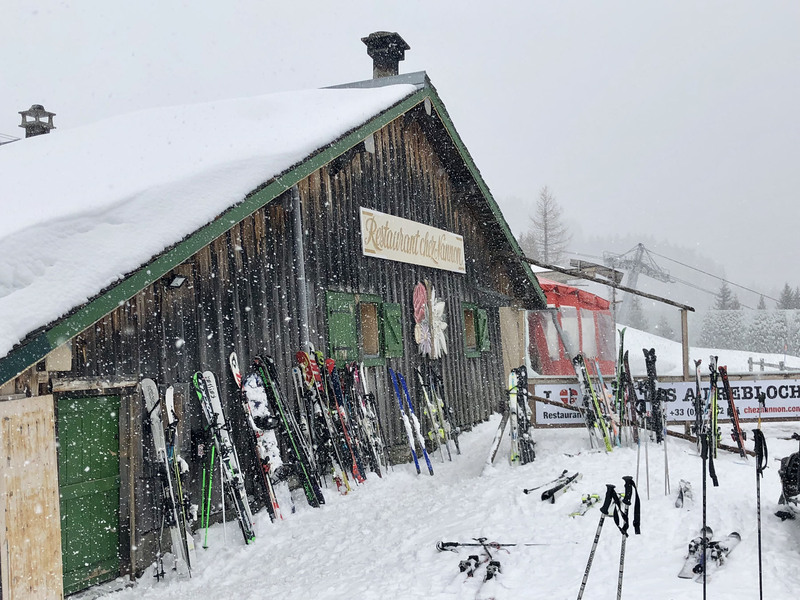 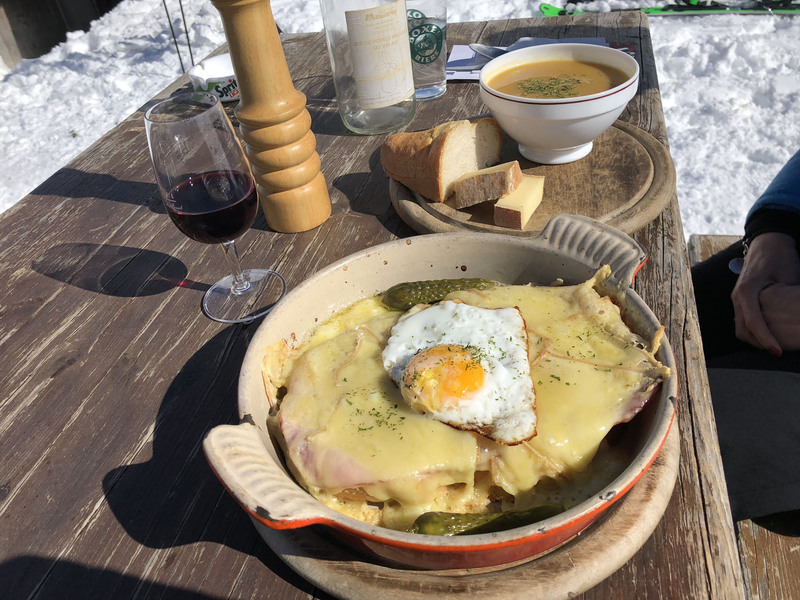 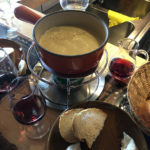 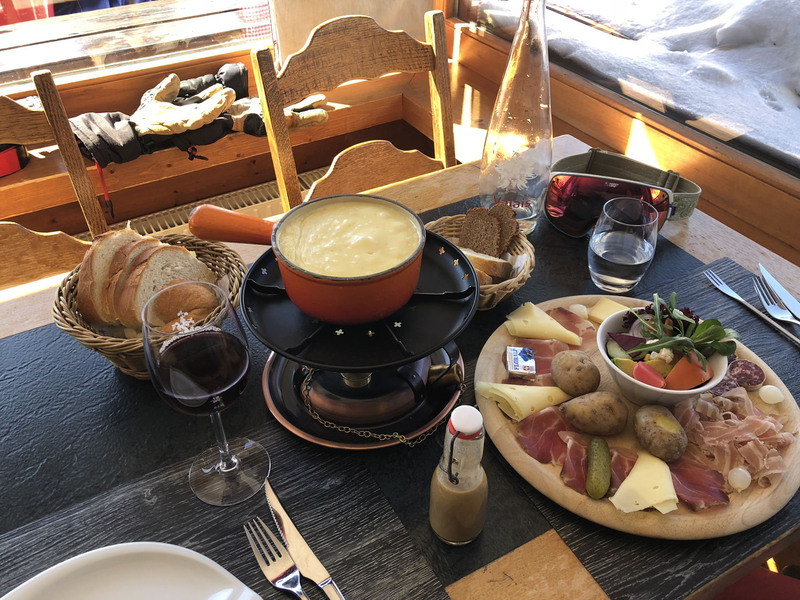 You can avoid Les Caveaux in Champoussin – nothing special, unless you like cheesy entertainment on raclette night, an old singer croons mistaken lyrics, and raclette is rationed out on small individual plates.